It happens every time and is very annoying (although I can understand the idea behind this). Since this didn’t happen on a Windows 2008 server it’s time to write something down. Plus… I always forget how to solve this, so it will be reminder as well. 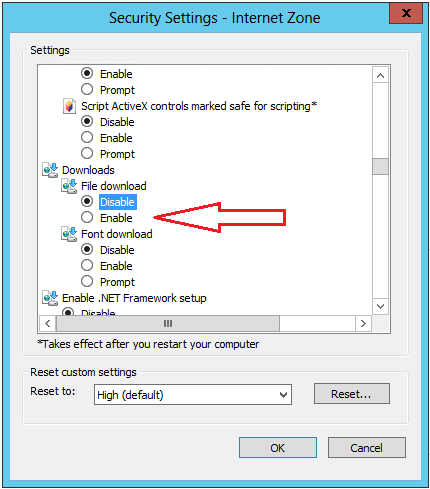 Windows Server 2012 has a tightened security model, and file downloads are disabled by default. To enable this, open Internet Explorer, go to settings and select Internet options. In the Internet Options select the Security tab. To change the settings click on Custom Level. 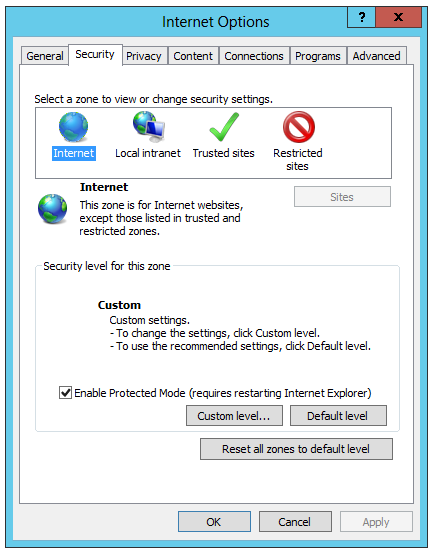 In the Internet Zone Security Settings window scroll down to the Downloads section. Select the Enable radio button and click OK to save the new configuration. The next time you start Internet Explorer you are able to download files.